I just added another classic Zeiss to my collection. This one is a 1960s AS 63/840 semi-apo. It has an air spaced doublet and combination draw tube and helical focuser. Much lighter OTA than a Telementor. The finder is from a Telementor II and is hence not original to the AS63. Would anyone of you know what finder was available for the this style AS63? The Telementor finder brackets are not correct. And, the 1940s and 1950s AS (with brass focuser) had finders that screwed via stem onto the OTA. I cannot find any information about what finder, if any, was configured for this style AS63. I've never seen a late tube version AS63/840 with a finderscope, unless it was fitted by the user. No doubt it was available, though. I'm puzzled about your remarks about the AS being much lighter than the Telementor. That wasn't my impression when I had the chance to use one. They felt roughly similar, from what I recall. The fairly big counterweight on the mount it sat on seems to support this. 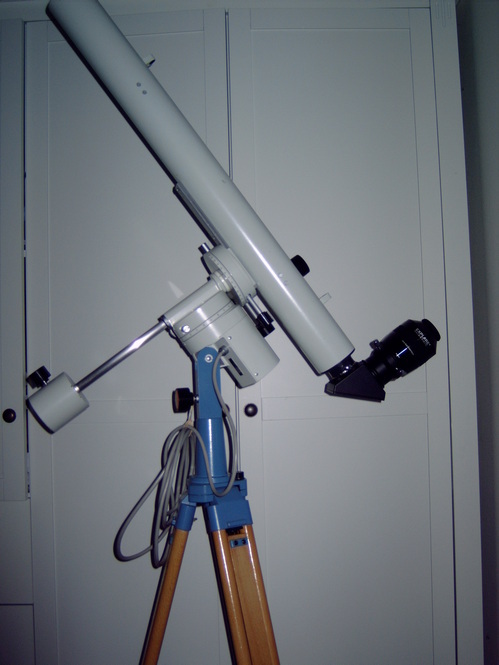 On your picture, the counterweight is also in much the same location as it is on my Telemator, when I use a eyepiece revolver and have the finderscope fitted. I believe there was no OEM finder for the Zeiss AS 63/840mm. I have a AS 63, Telementor I, and Telementor II. I just weighed them. I guess the difference is not as great as I would have thought, but still noticeable. All three scopes were just the OTA and focusers. No extensions, finders, eyepieces, diagonals, etc. 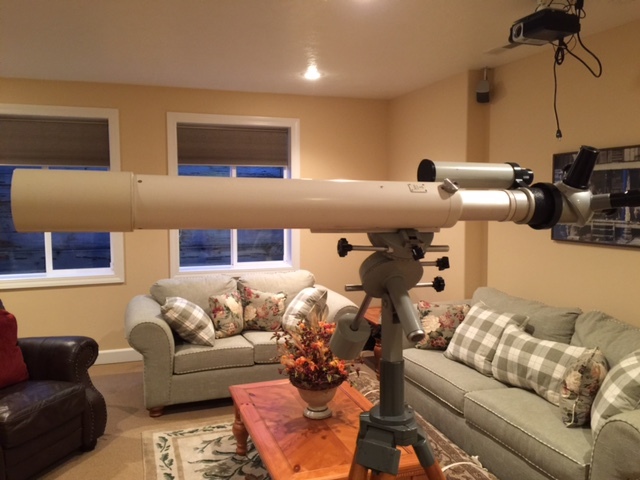 The reason why the weight was at maximum on the mount in picture was that I had balanced for a Telementor II with finder and turret, with 4 eyepieces. When I replaced the Telementor II with the AS, I did not rebalance. So, that was misleading. I have a variety of Zeiss catalogs from the 1920s through the 1990s. But, unfortunately, I do not have any that display this version of the AS 63. So, I can't figure out the finder question. I would guess that any finder that fit the helical focuser of the Telementor I would probably work with the AS 63 (the focusers are almost identical). But, I am not sure if that was intended with the AS. Regardless, my finder is for a Telementor II. I would suspect the T2 to be the most heavy of the bunch. The internal sliding focusing mechanism is and additional tube within the OTA that moves the objective back and forth for focusing. Yep, and my "experiment" confirms that. One thing that I really like about the T2 style of focuser is that you can hang ANYTHING off the end and there cannot be focus tube sag. It is extremely robust since the eyepiece end is solid and does not move. The tradeoff is that the front lens shifts ever so lightly when you move it. You can see the shift visually when looking down the front of the tube, but I have not noticed any "collimation" effect in use on a star. The AS design is a nice compromise to give a large amount of back focus while maintaining the accuracy of a helical focuser. The T1 requires spacers since the helical focuser is limited in back focus. The tradeoff is that the front lens shifts ever so lightly when you move it. You can see the shift visually when looking down the front of the tube, but I have not noticed any "collimation" effect in use on a star. Hmmm. The lens doesn't shift in any direction on my Telemator, other than smoothly back and forth. I've never noticed anything, at least. I'll check next time. Could yours be slightly worn on the bearing pads? I prefer my T1 with the helical focuser to the T2. Heaven forbid, should I have to pare down to just one, it would most definitely be the T1. Unfortunately, it's really a design that makes no sense. I remember the first time I saw one and was like ****?? move the lens?? Thought it was a typical German over think the engineering to come up with a complicated solution to a simple thing. To me, it makes a LOT of sense. Since the lens is relatively small and lightweight, it's actually possible to make the focuser smaller and more lightweight this way, instead of making a focuser massive enough to carry the heavy accesories the Telementor 2 *easily* carries on its threaded, non-moving visual back. And it's not complicated at all. It's just a crayford focuser with some of its parts turned around a little. And since the load is always the same, it's much simpler to adjust the friction once and for all, instead of having to deal with constantly changing loads that will either cause the focuser to slip or have it being so stiff, fine focusing becomes impossible. Thomas, good point. I'll check that. I happen to have some Teflon tape that I could add, if necessary. Bremms, I would respectfully disagree. I have owned several scopes with Chinese Synta-style focuses. Try hanging a 2" diagonal and Televue grenade off of them. Major focuser flex. I even had to adjust my Tak FSQ106N focuser for imaging purposes. The Zeiss solution in the Telementors just doesn't flex at all. The T2 design is more theoretically solid in this regard, but the T1 helical focuser is a joy. It allows very fine adjustments. Question about the AS63: I found a small black plastic part rattling around in it, and I cannot for the life of me figure out what it is or where it belongs. There is NOTHING plastic in the entire scope. The small part still has one screw in it. I thought perhaps it is to prevent the draw tube from sliding completely out of the OTA. But I have found no attachment points. Any AS owners out there? My T2's focusing is smooth, precise, with no backlash, and the feel is perfectly balanced. I haven't loaded down the Baader adapters yet, but they seem robust enough to carry the "hand grenade" eyepieces with ease. Yes, it seemed odd at first, and sometimes I forget where the big disk is at, but I wish all my small refractors had the same design. Well, I found out what the small plastic part does on the AS. 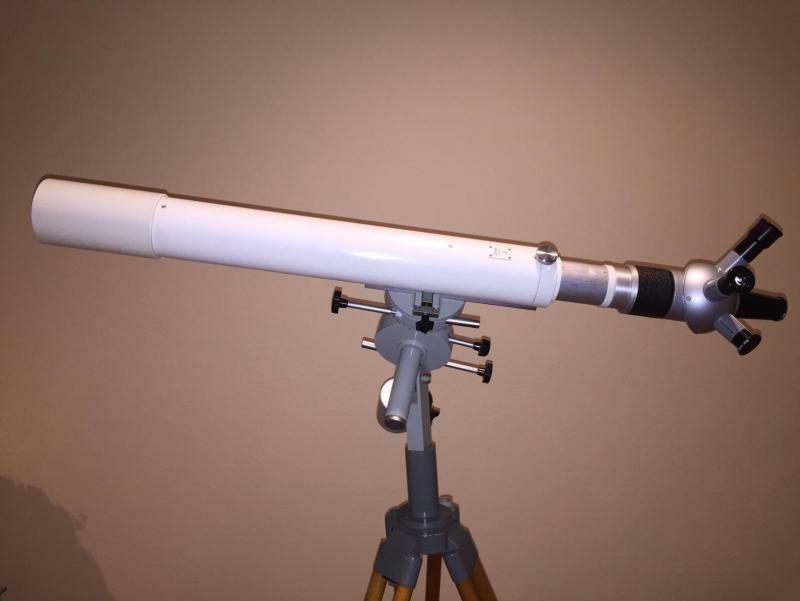 It is the only bit of plastic on the whole telescope, and attaches to the very end of the draw tube to prevent it from coming all the way out. I guess last night my eyes were too tired to see the very tiny screw holes at the end of the draw tube. Bomber Bob -- I agree with you. The focusers on my three Zeiss scopes are superior to most other focusers I have seen. Only exception might be rack-and-pinion Feathertouch focusers that are properly adjusted. I haven't loaded down the Baader adapters yet, but they seem robust enough to carry the "hand grenade" eyepieces with ease. I would suspect there are no baffles in the OTA ? Else, how does Zeiss account for " baffle placement / positioning " if the Objective is allowed to move back and forth? Seems that for this version of AS63/840 there was no finder available, same goes for its smaller and much rarer brother E50/540. 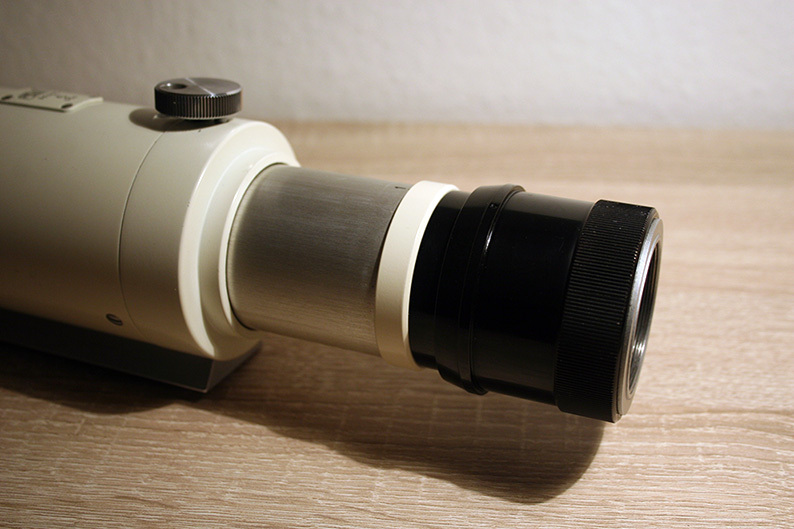 Historically there were other Zeiss 60mm scopes with no provision for attaching finder, but were mandatory with 80mm and larger scopes. This AS63/840 scopes were made in 60'ies and are simply superb. Long sliding draw tube makes assembly very short when collapsed. Attached picture shows original AS63/840 helical focuser. 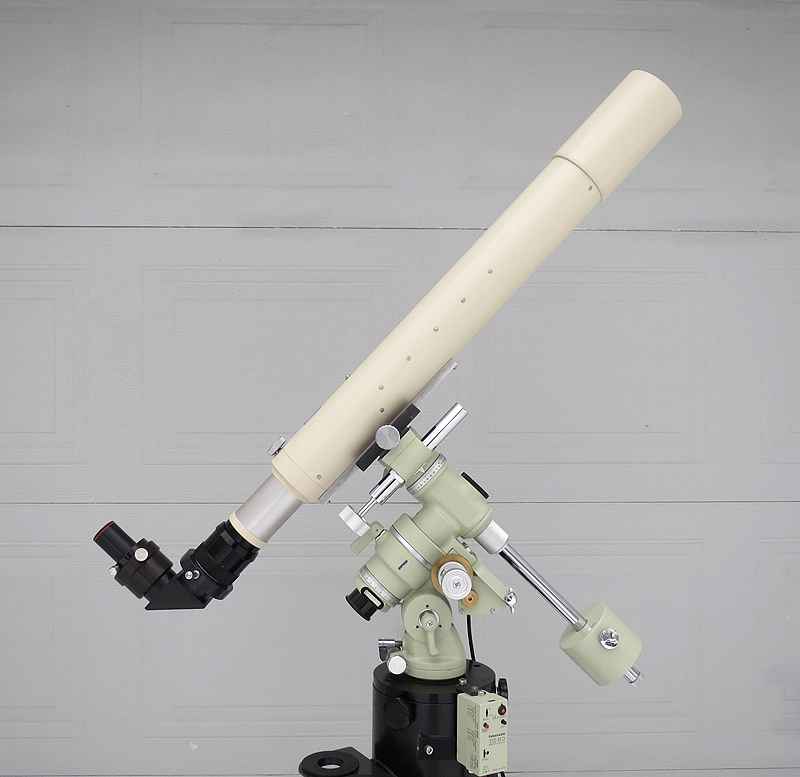 I had both T1 and T2 but I like the 1960 AS63/840 most, did I said already that this scopes are superb? The tube is well baffled! The solution is simple: The baffles move along with the objective. Yes, it is a tube within a tube. Rather ingenious. I know of none other like it. Example of Zeiss "Baffling" in my AS80/1200 scope from 1957, counted 9+ baffles. My AS63/840 has nine baffles. For me, one big advantage of the AS63 is the drawtube; it allows the use of a bino-viewers without any corrector lens. I completely disassembled my AS63/840 over the past few days. Had to to repair the small plastic piece that came off the interior end of the draw tube. I did not count baffles, but nine seems about right. Some within the main tube, and some within the draw tube. I also had to remove the guides within which the draw tube slides. The quality of construction is amazing. These scopes are designed and destined to be heirlooms. I also noted flocking within the guide tube. 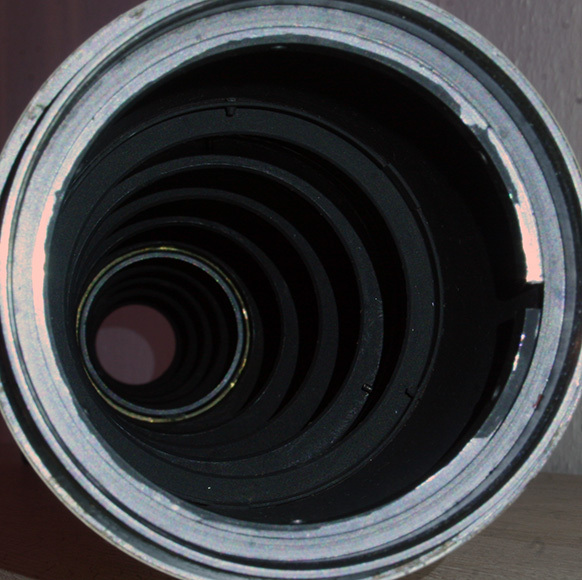 Flat black paint within the optical tube. Janez, do you happen to know the year of your AS63? Mine is the same style, but my helical focuser is slightly different than yours. Mine is identical to the focuser on the Telementor I. Concerning optical quality, some people consider the AS63 to be the finest scope Zeiss ever produced other than the APQs. I remember a much older thread here on Cloudynights where there were claims that the larger diameter Zeiss scopes (excluding the APQs) started to introduce more aberrations. I wouldn't know, since all three of mine are variants of 63mm diameter. Perhaps Janez can offer his opinion of the AS63 vs AS80? Perhaps Janez can offer his opinion of the AS63 vs AS80? I'd like to hear his opinion, too. I don't know about the other Zeiss apertures, but my T2 is the finest 60mm-class refractor I've ever used. As for build quality, only my Questar is a match for engineering design & execution. Not Janez here, but my AS63/840 looks to be the same style as his. According to Dr. Wimmer at Zeiss mine was made in November of 1963. I would agree with your assessment of the AS63 - my favorite. I once had an AS80/1200 and it was excellent also. Here's another photo of my AS63. It is nice to learn of some other owners is AS63's. I know that the AS63 is much rarer than the Telementors. Any idea on production numbers for AS63's and Telementors?